Not since Custer led the Seventh Cavalry against Indians at the Little Bighon has a fatal mistake so captured public imagination as the "unsinkable" Titanic being driven into an iceberg field at full speed. A double supplement traces the center of our continent from frontier days to the present. 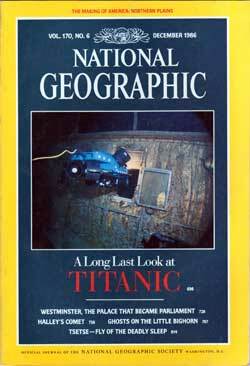 COVER: Exploring Titanic's hulk, a robot camera-equipped submersible called Jason Jr. peers into a first-class cabin. Photograph by Woods Hole Oceanographic Institution.